In 1975, Norm Lutz won the Rhode Island Open Championship in a two-hole playoff defeating Dana Quigley at Alpine Country Club. Norm hit his tee ball left on the first, not far from the water hazard. His approach shot was long requiring a pitch shot that he nestled to the cup for a tap in par and a halved hole with Dana. On the par five second, Norm hit his tee ball dead center and his second shot within 100 yards of the green. Norm hit his third about twenty feet, two putting for a par and the win. After the match, Ozzie Kooloian called his fellow members at Pawtucket Country Club announcing Norm’s victory. The membership assembled at the club house anticipating Norm’s arrival and the ensuing celebration. Norm invited me to join him in the festivities. As we walked through the front doors at the club, over 100 fellow members stood and applauded for several minutes. Norman had brought home another championship! The second foursome off the first tee: Clint Dailey will be flying home from Cincinnati. “Quint” told me that he plans on making the annual hermitage to “The JT Classic”. Clint being a big fan of Aimee Smith launched his golf career playing left handed. Rounding out the foursome will be fellow members of the graduating class of Tolman 1973, Bob Ferguson “Fergie”, Dave Kalafarski “Ski”, and Rod MacKenzie “Big Mac”. We all played as teammates with our dear departed friend, Malcolm Najarian, and coached by “Gig” Pariseau. Ski once hit a tee ball on the first at PCC that hit the woman’s tee marker, elevated over the Pro Shop and landed in the pool. Next off the first tee: Stan Abrams from Granite Links Country Club Quincy, Massachusetts, Norm Lutz from Bear Lakes Country Club West Palm Beach, Florida, Jim Noonan from Baltsurol Country Club New Jersey, and Jim Tanner from Pawtucket Country Club. Stan won 2 RI State Amateurs and represented US in a Walker Cup. Norm won 2 RI State Amateurs, a RI Open, and several RI State Fourballs with his partner Len Jenard. Jim Noonan qualified for the USGA Junior Championship in 1954 and played Jack Nicklaus in his first match at Los Angeles CC. 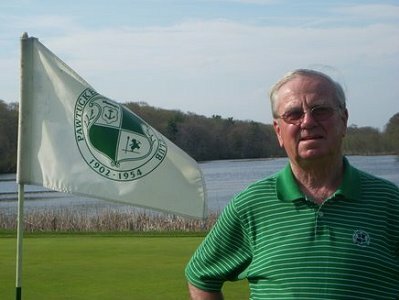 Jim Tanner won the RI State Caddy Championship for PCC in 1953. This year we have former Pawtucket Caddies traveling from several states. Mark Najarian from Dallas, Steve Boghossian from Chicago, Paul Markley from Woodstock, GA, Clint Dailey from Cincinnati, Jim Noonan from Baltsurol, NJ, Timmy O’Neil from Darien, CT, Les Kennedy, Jr. from Purchase, NY, John Giglio, aka gigs, from Venice, FL , and Mike Carroll from San Diego….. Some notables that plan on playing include Norm Lutz from Bear Lakes Country Club in West Palm Beach, Stan Abrams from Granite Links in Quincy, MA and Ed Kirby the Professional at Alpine Country Club.